​Check out my new blog called Faith and Betrayal. I will be posting from today and will post three times a week(Monday, Wednesday and Friday). It’s a completed blog so you won’t have to wait for posts unless I have no access to the internet. Sorry for the delay, I had promised this one a long time ago but the Almighty had other plans. This is the link to my new blog on WordPress. Hope you enjoyed reading. Thank you for your support. We’ve been waiting for months for this good news and finally it was here. Safiah’s divorce has been finalised and she can finally move on. It’s been an emotional few months for us all. First with the good news, Ahmed and his mother patched up and everything was normal between us. We spent our first weekend with them in their house last month when it was his parent’s anniversary. Yaseen and Raeesa got a divorce and Yaseen is now studying further and working. He hasn’t found anyone as yet but I’m sure one day he will. After all there is someone out there made specially for each of us. He is much more happier now and he has made so many new friends. Ahmed and I are enjoying his company everyday. He is such a ball of fun and excitement. Saibah has also grown very fond of Yaseen. Tomorrow is my baby’s birthday party, I can’t believe that a year has past. She just grew too fast, I’m lucky not to have missed all her special moments. She has definitely filled our lives with so much joy and has made us proud parent’s. I couldn’t have asked for anything to be different, yes I had a difficult life but my baby made it all worth it. She has made my life complete and has brought our families together. Both my family and Ahmed’s family will be coming over later. We will be all staying in our house together for the first time. I know my family will manage but I’m not sure about Ahmed’s will manage. It’s their first time staying with us so I’m a bit worried. Ahmed is excited to have everyone over at the same time and he’s even more excited that his princess is turning 1. We having a huge party for Saibah’s first birthday but not only because it’s her birthday, this was our special way of getting all our family together. There’s one relationship we have to work on and that’s between my mother-in-law!and her youngest sister. Ahmed has decided to do this task so he will talk to them in private just before the party, it’s a difficult task but we have to give it a shot. Our families arrived and all got to their rooms and freshened up before we could start all the hard work for the braai tonight. Humeira, Faheema and I got working on salads and then drinks. The men were watching the cricket and my mum and mother-in-law were looking after the kids. Zinat and Sameera are also here from tonight, the rest of our guest only arrive tomorrow for the party. This morning I woke up feeling sleepy, we stayed up talking till early this morning, I managed to get only few hours of sleep. After breakfast we set up the back yard for the kiddies, we had someone come in and set up for us Jungle jumping castle, slip and slide and a soft play park, we had mini cars and horses they could ride and had a few acts planned for the day. For the adults we set up inside, in the living room and dining room. All our close family started arriving, as soon as Ahmed’s choti khala walked in he took his mother and his khala upstairs to our room and had a talk with them. He left them in the room for a little while after he spoke to them and then went to see if things changed. I am so proud of him, no matter what the results are I am happy that he decided to take a step forward and try to sort things out between his mother and aunt. Well all the kids were enjoying the party, Saibah was sitting with my dad enjoying the show that was put on. After the kids played a little and watched one or two shows we served lunch to everyone. We had a caterer prepare for us lunch, after lunch we let the kids play again and enjoy themselves. I saw that Ahmed’s mother and aunt were talking so I figured things were sorted out between them. We cut the cake and served tea,Saibah was so excited all the attention was on her. She didn’t manage to blow all the candles but all her cousins helped her. I was exhausted by the end of the day and just wanted my bed and pillow. It’s strange how we can go with years despising someone in our own family. We sometimes grow up with that person and shared so many wonderful memories with that person but they make one decision you don’t like and you despise them forever. We sometimes are so blind in our ego we don’t appreciate our family members. The fight between a mother-in-law and daughter-in-law will probably last forever and we might end up seeing our daughters having the same problem when they are daughter-in-law’s and mother-in-law’s. It’s something that no one can fix. Yes there are good daughter-in-law’s and mother-in-law’s and they have the best of bonds but not all five fingers are the same. The one thing a mother-in-law or a daughter-in-law can do is overlook what the other does and find the good in each other. This goes for family members and siblings as well, what I’ve realised is that we always looking for ways to make conversation with each other and when there isn’t a topic we take to gossiping which leads us into trouble because as much as you think the person in front of you is your family member and won’t tell the other remember they also family to that person and would go tell that person what you said the first chance they get. Remember also that only you can safeguard your image, other’s will always find ways to make you look bad so don’t give them that chance. Whether it’s with in laws or your own family, there is always that one person that will try their best to make you look bad. One thing every person should remember that the same person you engaging gossip with is talking about you to the person they gossiping about. Today my family and my inlaws are here spending time with us, my mother-in-law has accepted Saibah and I and we have started to share a special bond that I pray never breaks. I wish to see my Saibah grow up with all the love she deserves from both her grandparents and both sides her uncles and aunts and not forgetting cousins. It’s never nice to see someone suffer and not move on and find happiness so I wish all the happiness to both Yaseen and Safiah’s. May they both find their partners and all the happiness they deserve. I hope you all enjoyed reading my blog and will enjoy reading my new blog. Will be posting the new blog in a few days. I will inform you here when I start the new blog. My new blog will be called “An Indian girls sacrifice”. PLEASE NOTE THAT I AM WRITING A NEW STORY AND WILL POST BOTH ON WORDPRESS AND WATTPAD…. I will publish the name when I post the final post to this story. This morning Yaseen and I went out for breakfast, then we went to meet with the florist and decided on what flowers we wanted, she showed us a few examples of what she can do and I sent the pictures to Sakina for approval, then we met the caterers, the menu is already decided so we just had to place the order and make sure she was available for our dates. It felt weird to plan this with Yaseen since he is just went through a bad marriage. He has been positive so far, he gave input when needed and he was very excited to help. I guess he has to move on and he needed this break to get away from things that reminded him of Raeesa. The flat was his biggest reminder, I’m glad he got rid of it. He says it’s difficult at my parent’s because he feels guilty for putting them through all the trouble and fighting with them about Raeesa. He knows they forgive him and have moved on but he can’t forgive himself for putting our family through all that emotional stress and at the end it turned out that he was defending someone who didn’t deserve it. It frustrates me to see him like this, feeling so miserable, hopeless and like a loser when actually he is no loser. Yes he made bad choices and now he is paying for it but he was brave to get out when he could. What annoys me is that she walks around like nothing happened with no shame or guilt. Her parent’s also have no remorse for what she did or for them keeping the truth from us. They have this don’t care attitude unless it’s harming them, her father played this very strict respectable man when infact they nothing like that, for all we care they probably part of her tricks and it’s all planned out. We got home just after 4pm, Ahmed messaged that he wanted to skype so I messaged him when I was ready. We haven’t seen each other in two weeks, we messaged and called each other but never skyped. It was good to see him, although it was over the net. He is not sure as yet if he will come a few days earlier. He has just a week left in Malaysia so I don’t think he should rush, it would be different if it was a few days earlier. Yaseen and I had dinner and then we sat on the edge of the pool, dipping our feet in the water, talking about Yaseen and what he is going to do now. He wants to leave his job and move to Jo’burg to study further but my parent’s are against it because he will be closer to Raeesa. I don’t mind him living with us, but I don’t want him to do it because he feels he can get closer to her and watch what she does. At the end he will only be hurting himself and his family. I don’t think he would be stupid and get back with her but I feel he would like to know certain things like if she moved on, has she met someone else, what she is doing in life and that is only going to hurt him more. He is going to be miserable if he sees she is enjoying life while he is sulking away. The best is to ignore what is going on in her life and to make a better life for himself. I have been keeping in contact with the lawyer’s since Ahmed has gone and we have a bit of a wait until we can hear any good news about the divorce. It’s not as easy as we thought. I am frustrated that it is not going our way and what makes it worst this morning I hear from the lawyer that Raeesa has refused to sign the papers, which means Yaseen can’t move on. Everything comes down to her now which is awful. I haven’t told Yaseen anything because he is in such a good mood and I can’t deal with his anger alone so I don’t want to put myself into that position. At least until Ahmed is here and he can handle Yaseen and his anger. We lost track of time and surprisingly Saibah slept all this time. I looked at the clock, it was 11:30pm. I locked up and then we went to bed. I jumped into bed and Saibah woke up. I woke up this morning in a chirpy mood, we were going on a shopping spree today to help Rizwana and Farzeen get their outfits. Yaseen was tagging along, he would of been bored at home anyways. Ahmed is returning later today so I’m overly excited. Rizwana and Farzeen came to the house just after 10am, we had a quick snack and then left to do our shopping. I left Saibah at home since I am in Lenz and with her shopping would just take longer. We went window shopping first and enquired about the outfits and then decided which ones we really liked. After we got both their outfits we went back to the house and had lunch. Imraan was fetching them after work so we watched tv and the girls played with Saibah before he came to get them. The driver fetched Ahmed from the airport, I am so glad he is back. Finally everything can get sorted out. The most important is Safiah’s and Yaseen’s problem’s. They in problem’s that are not allowing them to be at peace while both their partners are at peace. A few minutes after the girls left Ahmed walked in. He was happy to be home and we were happy to have him home. We sat for a while and then had supper. Ahmed went upstairs to get some sleep. I sat to read my book while Yaseen played games. Saibah was asleep so I enjoyed my quiet time. I went upstairs to sleep and Ahmed just woke up. We spoke for a little while catching up on stories. He decided that he would sort out both Safiah’s and Yaseen’s problem’s soon. He also needs to sort things out between his mother and himself. She has been calling me while he was away saying that she wants to apologise for all the wrong she has done to me and all the pain she caused. This morning I told Ahmed about all the calls his mother has made to me since he left and that she has apologised and we have sorted things between us, now he has to call her and sort things out between them. He has no excuse not to forgive his mother because the reason he was arguing with her was Saibah and I and now that she has accepted us and apologised he has no fight. He promised to call her after breakfast and he did so. Yaseen and I spent the day shopping for the wedding while Ahmed went to see the lawyer’s for Yaseen’s case. Finally we had some good news, Ahmed took the papers personally to Raeesa to have them signed. I don’t know how but he got them signed, soon the papers will be filed and they will be divorced and my brother can move on. Safiah’s has been doing well and has been discharged so Ahmed has arranged for her and her parent’s to come back to Jo’burg. Soon he will have her divorce papers filed and he knows it will be a quick case since Reeza is guilty of alot of things and Ahmed said he was going to speak to Reeza and tell him if he signed the papers we wouldn’t lay charges for all the other assaults and all the other things he did wrong. We also found out about his dealings with drug dealers but we didn’t let him know about it. As soon as Saibah opened her eyes I called Nomsa to take her. I needed some sleep and if I didn’t get it I would be very moody. I set my alarm for 11am, closed the door and pulled the upstairs phone off the hook, it’s Saturday which means my mother and Faheema call in the morning. Just seconds before my alarm can ring I wake up, I take a quick shower and go down for breakfast, I make myself crumpets with strawberries and nutella. Nomsa gets Saibah dressed while I got everything into the car. Nomsa was coming with me so she could take care of Saibah. When I got to Sakina’s house Saibah was asleep so I didn’t stress too much about her. I showed them what I came up with and people we could use for the wedding, they changed a few things and agreed to use the people I found to help on the day. It was a quick meeting which gave me time to visit Aunty Rubina. It was strange going back to my old place even Nomsa said it felt nice to visit the complex. There’s no one staying in the apartment I was staying in. We surprised them so they were really happy to see us. We sat and spoke about our days together, the outings we had, the fun times and we even made fun of some of the things we did. Imraan was our main target though, we teased him about the things he did to meet up with Sakina. I got home just before maghrib, I fed Saibah and then left her to play while I made something for me to eat. After maghrib I sat and watched a movie, Saibah was asleep so it was a good time to watch a movie. I haven’t watched a complete movie in a long time. Well I didn’t end up watching the full movie, I fell asleep and all the blame goes to my sleep deprivation. I woke up two hours later when Saibah wailed. Today I’m having Uncle Abdullah and his family over for lunch, I got out of bed early, did all my chores before I started cooking. I’m making leg roast with veggies, I’m making sojee for the sweet dish and we having ice cream for dessert. They got here around 11am, the girls were all over Saibah, they didn’t leave her for a minute. After lunch we sat and discussed what they were planning for the wedding and walima. Farzeen and Rizwana want me to go with them to look for outfits so we make a date for next weekend. We don’t have alot of time, this wedding is in a months time. As soon as they left I called Ahmed, it’s two days and he hasn’t called. He knows I worry if he doesn’t call or at least message. He was really busy, we didn’t speak long, he told me he would call once his meeting was over. My cousin Aneesa called, they were going out for dinner, she asked me to join them. Aneesa and Faheem fetched us, I was glad I didn’t have to drive alone, I hate it especially when I got Saibah with, I just don’t feel safe. We went to spur for dinner, it was nice, although noisy which always is at any restaurant you go that is full of indians. After dinner we took the kids to play some games at the entertainment centre. We got home quite late, I went straight upstairs, made Saibah sleep and then I watched a little tv before I fell asleep. I heard my phone ringing, I looked at the time and it’s 9am, I looked at my phone and see it’s Yaseen. He wants to come to Jo’burg, I’m not sure if it’s such a good idea because Raeesa is this side, I don’t want him to confront her or complicate things by doing something silly. I also don’t want him to feel like I’m pushing him away when he needs me so I agreed to him coming but on the terms that he goes where I go and he doesn’t do anything silly that would cause trouble. He said he would be here by the evening, I got ready, had breakfast and then started preparing for supper. I didn’t bother about lunch since I was alone. I made his favourite pasta dish and for desserts I made pineapple dessert. I called Safiah’s parent’s to see how she was doing. She has healed well but emotionally she is not doing well. Reeza obviously got out on bail which made her feel worst but she has hope as the police officer has assured her that they got enough evidence to get him some years for what he has done. Personally I don’t think the police officer should of said anything because we all know South african law. The doctors are discharging her in a few days, they will stay at the villa until she has healed completely. I am glad that she is doing much better, I hope that she recovers both emotionally and physically, it’s going to be a tough journey, only she knows what she is going through, the pain she is feeling. I just wish she keeps a positive attitude throughout her healing process. Zaheer said he will have his friends visit her often. Maybe they will be an inspiration to her, the one is a psychologist and the other is an Aalima, so they will help her both spiritually and emotionally. She needs a lot of attention, love and care, her parent’s are going to be her biggest support. They will have to be patient and forget about themselves this time and only concentrate on her. I hope they understand what she is going through. I went to the mall to do some grocerry shopping before Yaseen got here, I want to stay away from shopping centres with Yaseen around, it’s going to be difficult since I am shopping for the wedding. I will have to work around it and be careful, maybe I can take him along to babysit Saibah. Yaseen arrived just before maghrib, he looked really tired, I asked him what happened, apparently he hasn’t been sleeping. He feels he needs to get away from his daily routine, he only managed to clean out his flat this week. He couriered all Raeesa’s things to her already and the rest that he bought after like furniture and stuff were all sold off. He didn’t use the money as yet so she can’t blame him for not goving her money from it although she didn’t buy any of it with her money. He called her to ask what she wanted to do with the furniture and she said he should get rid of it. We had dinner and then Shiraaz and Sabiha came over with the kids so we watched a movie while Nomsa and Thandi looked after the kids. Sabiha was telling me that she also hasn’t watched a movie since Lutfiya was born. I guess until you a mother you don’t realise what mother’s go through. While we were watching a movie we heard someone screaming outside, Shiraaz and Yaseen went to see what was happening. A few houses away from us there was a fight between neighbours. Apparently one neighbour put his garbage bags on the other neighbours side and the dogs ripped it apart, neither of them wanted to pick it up so instead resorted to screaming and swearing each other in the street. It’s the first time Yaseen and I experienced something like this, we’ve always grown up with family as neighbours. Our other neighbours we’ve never had problems with and if there was a problem they would always come and discuss it or we would go to them and discuss it in a polite manner. This was literally aunties telling each other how they would hit the other, pull out each others hair or throw garbage all over their lawn. It was awful to see and disgusting to see women carry on in a rowdy manner. This morning Zaheer called, he needs to get in contact with Safiah so he can have someone go over to her place and see how she is living and to get her out. I called her this morning but she didn’t answer, so Zaheer had his friend go over. They found her on the kitchen floor, she was badly beaten. It broke my heart hearing about the things Reeza had done to her and to know she laid there unconcious for the night. They rushed her to the hospital and had a charge laid against Reeza, but they had to wait for Safiah to wake up to lay the charge. I prayed the whole day that she would wake up and more that she would agree to laying a charge against Reeza. I know that after all that he has done she will still want to be with him because she loves him. She doesn’t want any harm to come his way but if she doesn’t take this one step forward then there is nothing we can do. We can only do so much, she has to take the steps to make her life better. Zaheer’s friend calls me after a good few hours, Safiah has finally woken up. She is in a lot of pain but the best news was that she agreed to lay a charge. They had a police officer take her statement and they were going to arrest Reeza. We didn’t tell her parent’s anything as yet but we need to soon. They need to see what this man has done to their daughter. Shiraaz went with me to see Safiah’s parent’s, we were welcomed well but they didn’t take the news too well. At first her mother said we were making up stories until we made a video call to her so they could see for themselves what she was going through. Her father was not happy about getting the police involved but after Shiraaz spoke to him he was okay with it. We arranged for them to leave to Cape Town first thing in the morning. They need to be with Safiah, she need their support now more then ever. I wish I could be with her but it’s just not possible at the moment. We trying to get her to Jo’burg so she can be with her family but this will only happen once she recovers and that is going to take time. Her doctors have said that she has some broken bones and internal injuries. I woke up ready to take on another day, hoping it would be less hectic then the days before. It’s been three days that Safiah is in hospital, the doctors say she is making progress and if it continues like this she will be out in a week or so but will have to rest. I’ve arranged for them to stay in our Villa for the time they are in Cape Town. I don’t want her to go back to Reeza’s house. Her parent’s have already taken her things so she doesn’t have to go there. Sabiha and I are going out with the kids today, Ebrahim has been troubling her for few days now, so we decided to take him out. We taking them to the lion park, it’s one of Ebrahim’s favourite places. We had breakfast and then I fetched Sabiha, I took Nomsa with so she could help with the kids, especially in the car. When we got to the parking lot Lutfiya and Saibah were asleep but woke up as soon as we entered the place. The day was filled with loads of fun and adventure, the kids were definetely exhausted and so were we. We got home just before dinner, we ordered out, I had no energy to cook. Saibah was fast asleep, she was really tired, I was glad she was getting some sleep and that meant I could rest too. Ahmed called this evening, he is home sick, it’s only been a week and already he is missing home. He still has two weeks left, he wants to finish up sooner if possible and have his flight moved but he can only do that once he gets to Malaysia and sees the progress on business there. He will be in Malaysia by tomorrow evening so he can decide then what he wants to do. I got so much to do still for the meeting I’m having with Sakina and her parent’s. I hope they like my ideas, it will make things so much easier if they do. I woke up to my alarm blaring, I got ready and then went downstairs, made myself some scamble eggs with mushrooms and sausages. Saibah was still asleep so I took advantage of the time I had and worked on some ideas. Sakina had no time to plan a wedding, she had exams and had to concentrate on studying so she left it all up to me. Aunty Rubina is doing everything for their side but she wants my input on everything. 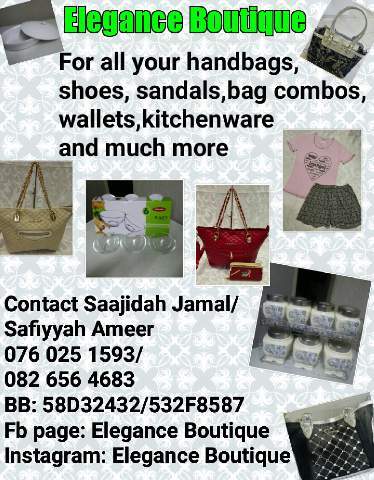 She had Farzeen send me pictures of everything she liked, she is coming to me on Sunday to discuss other things. I got in contact with some people I thought would be good options to get things from, now we will have to see if Sakina likes them. Saibah woke up shortly after I finished all my work. I unfortunately can’t get much done when Saibah is awake so I didn’t even try. I didn’t trouble Nomsa and Thandi because they had enough work of their own. I went to the mall this afternoon, I bumped into Raeesa and her parent’s. I didn’t know how to react, I felt like slapping her and walking away but that’s not how I was brought up so I greeted them and moved on. I didn’t even want to know what they were doing in Lenz. After my shopping spree I went to visit my dad’s sister Amina. She has been telling me to visit for a long time and I always had something on. I sat with my aunt and my cousin Aneesa catching up on our lives and stories about the family. My cousin from Maputo is getting married he will be coming to South Africa since the girl is from here and all his family as well so we were discussing their plans. We were so engrossed in chatting I didn’t realise it was getting dark. They wanted me to stay for dinner but I had to get home and after all that snacks I was full. Ahmed called today, he landed in Malaysia, the meeting is only scheduled for tomorrow so he will only know then of he can come home early. I think he is feeling it more because of the fight he had with his mother. He is feeling guilty and him being so far doesn’t make it easier. I suggested he calls his mother to sort things out but he refused. He won’t admit that he is feeling home sick because of the fight he had. I put Saibah to sleep hoping to get some sleep myself. It’s been really tough these past week without Ahmed. He usually helps at night with waking up for a feed or changing her, now I’m doing it by myself so I am feeling sleep deprived. I’m thinking of letting Nomsa see to Saibah in the morning so I can get some sleep before going to Sakina’s house. Saibah didn’t sleep for long which meant no sleep for me. I tried not to entertain her playfulness but she refused to sleep. I was too exhausted to sit on the chair and make her sleep so I broke the rule and put her on the bed next to me so I could sleep aswell. I know I shouldn’t of but I couldn’t help myself. I would be a walking zombie in the morning if I didn’t get a little sleep. This morning Ahmed woke up in a good mood and decided we should go out for the day, just Saibah, Ahmed and I. We went to the mall for breakfast and then went for some shopping and then we went for a picnic at the zoo lake. It was a lovely relaxing day with my family. When we got back Ahmed went straight to the study, he had a big meeting in the morning and still didn’t prepare for it. I sat with Saibah downstairs in the lounge and watched tv, then I made chicken mayo sandwiches for dinner. After dinner I went up to my room, I left Saibah to play by herself while I sat on my phone browsing through facebook. I haven’t been on any social media in a long time feels like forever. While browsing I see all these pictures of Raees and a lady, that reminded me that I have not kept in contact with Safiah after our chat. I’ve been so busy with my life and all that had happened with Yaseen that I forgot about her problems. I feel really bad that I wasn’t there for her. I called her and was horrified at the things I heard. Raees has left her, he didn’t divorce her, he told her he will never divorce her but he will not stay with her. He supports her financially by sending a cheque every month for clothes and grocerries. She has spoken to her parent’s and they don’t want her to leave him or come back home. They told her that there is no place for her and what would people say. Raees has someone watching her all the time so she is not allowed to leave the house unless he tells this guy that she is allowed to for shopping. He has come by once or twice but hasn’t been pleasant to her, he only comes to beat her. I cried after I put the phone down, my friend was in so much pain and I felt so helpless. I know Ahmed has alot on his plate right now and I wouldn’t trouble him if it was something small but this is huge and I need his help I just don’t know what can be done. We have to consider that he is her husband and he has to give her the divorce, she can’t give him a divorce islamically. I think a little about it and then I decide to speak to my cousin Zaheer. It was late already so I decided to call him in the morning. Ahmed came to bed, I told him about Safiah, he was shocked and upset that she was going through so much and we didn’t do anything about it. He was quiet for a little bit and then turned around to sleep. This morning was hectic, it was such a rush because Ahmed had to be at the office early. After Ahmed left I went upstairs took a quick shower and then got Saibah dressed. I couldn’t get my mind off Safiah’s situation, so I went to visit Sabiha for a little bit. When I got home I called Zaheer to discuss the problem Safiah is having. He gave me some solutions and now it’s all for Safiah to decide if she wants out and what she is willing to do. Ahmed got home just after midnight, I heard him come in and get into bed so I assumed he ate already. The whole week went by and Ahmed and I haven’t spent anytime together. He would leave early and come back when I was asleep. He has been really busy at work, he has called once or twice to tell me he would be late. We at the weekend again, Ahmed is going away on Sunday morning, he has a trip to London and then from there he will go to Malaysia, he will be gone for three weeks. I’m feeling really depressed, I will be alone for three weeks. I don’t want to go to my parent’s, so I’m just going to stay at home. Ahmed was busy the whole day with work, I packed his bags and made sure he had all his things with him. Saturday went by and Sunday was already here, my anxiety was crazy, I know I will manage, I stayed alone for so long but I was use to having Ahmed around. I think I felt it more because the last few weeks haven’t really been our best weeks and we left alot of it unresolved but moved on. Ahmed took some time today to spend with Saibah and I. We went out for ice-cream just before he left to the airport. It didn’t really get to me Sunday night until I realised I was alone in bed. I twisted and turned for a while before I could sleep. Ahmed was already on his flight and probably asleep as well. During the night I woke up for Saibah’s feed, I couldn’t go back to sleep. This morning Saibah was awake super early, I had Nomsa take her downstairs so I could get some sleep. I woke up in a shock, I looked at my watch, it was 11am. Ahmed had not called as yet, maybe he was just settling in or busy. I took a long relaxing shower, got dressed and went down for breakfast. I wasn’t too hungry so I just had a cup of coffee and a slice of toast. I was not liss to cook for one person and there were leftovers for lunch so I relaxed. Sabiha came to see how I was doing we made plans to have dinner together, I took on the task to prepare the pasta salad. I remembered we were suppose to start planning Imraan and Sakina’s wedding. I called Sakina and arranged to meet with her parent’s this weekend so we could discuss what they want. I will have to work on some ideas before meeting with them. I was glad I remembered because now I had something to keep me busy. Ahmed finally called just after I had lunch, he landed safely, he was doing well just a bit tired. We didn’t speak much, he wanted to get some sleep. I checked online for places that would be good to use for the wedding. I checked out venues, catering places and caterers, and florist. We have a bit of time to prepare for this wedding so I’m trying to get the best prices. After a few hours working on ideas for the wedding I took a break. Saibah was awake so I played a little with her and then got ready for dinner. I had Nomsa help me to Sabiha’s house. It was a lovely dinner, the company was good and I got away with eating alone. Ebrahim enjoyed playing with Saibah and she loves him to bits, Lutfiya has a flu so she was asleep. When I got home, I locked up and then went upstairs to my room. I thought about having her sleep with me on the bed and realised it was not such a good idea, Faheema’s words rang in my ears. I was not taking chances just for my comfort. I made her sleep and put her down in her cot. I hopped into bed, I sat there thinking about Safiah, I hope she agrees to leave cape town. She cant stay there in such a relationship. It is up to her so I can only offer her help and hope for the best. Maybe she will see that she will be better off here with friends and family instead of being subjected to such bad treatment and being left alone. I still can’t believe that Raees could turn into such a person. It makes me sad to think about all the ladies who have had their lives ruined by man who have no heart.